Their explanations tend to focus on specific economic or political factors, such as booming raw material prices or the MAS’s ability to control and co-opt the country’s social movements. However, to understand why Morales will soon become the longest serving head of state in a country renowned for its history of coups and rebellions, it is necessary to start with an acknowledgement of the profound changes that Bolivia has undergone during his presidency. For some, the old saying “it’s the economy, stupid” neatly summed up the reasons for Evo’s victory. They argue Morales simply rode the wave of high commodity prices, or promoted the ongoing expansion of lucrative extractivist industries, irrespective of social or environment costs, in order to use these funds to boost his popularity. Yet, these views ignore (or purposely conceal) a basic truth, namely that Bolivia’s economic success is a direct result of the MAS government’s program for economic transformation. This program has focused on weakening transnational control over the local economy and diversifying the economy away from its position of dependency on raw material exports. A key plank of this program was Morales’ 2006 decree nationalizing the all-important gas sector. Without this move, any increased windfall from higher commodity prices would have inevitably flowed out of the country, as it had under previous governments. Instead, the capture and dramatic internal redistribution of Bolivia’s gas wealth helped fuel a huge surge in domestic demand, as ordinary people were lifted out of poverty and finally able to attend to their basic needs. In fact, Bolivia’s record growth rates had more to do with a booming internal market than with external demand, which actually had a negative affect on growth during the global economic crisis. Increased revenue derived from nationalization also enabled the Morales government to take steps towards making the local economy less dependent on raw material exports. The government launched its industrialization program, which will soon see Bolivia go from a position of importing processed gas to exporting liquefied petroleum gas and other derivatives (for much higher returns). Furthermore, the redistribution of gas revenue to other productive sectors has facilitated growth in non-extractive based industries. This is particularly true for those sectors that provide livelihoods for a majority of the MAS’s social base, which is largely comprised of small-scale farmers, cooperative miners, street vendors and those employed in family businesses or micro-enterprises. Economic diversification has also meant that growth in manufacturing outpaced both the mining and gas sectors last year. The idea that Morales’ success is the result of external or internal economic factors such as high commodity prices or dependence on existing extractive industries is as simple as it is wrong. The truth is that support for Morales is actually a result of the economic transformation that has taken place in Bolivia. 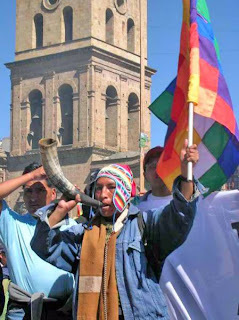 Many analyses also ignore the critical role that Bolivia’s indigenous and social movements have played in revolutionizing the country’s political set-up. While the nationalization of Bolivia’s gas was officially decreed by the Morales government, it was in fact the direct result of years of struggle by the Bolivian people. At the heart of these struggles was the demand to nationalize the gas in order to redirect this wealth towards meeting peoples’ needs. Unsurprisingly, opinions differ as to what exactly should be done with this wealth. Given the highly organized and mobilized nature of Bolivia’s popular classes, these differences have often been contested in the streets. As a result, the second Morales government (2009-2014) witnessed the highest rate of protests for any government in Bolivian history. Only a tiny minority of these protests focused on issues to do with resource extraction. The overwhelming bulk revolved around disputes over resource redistribution. This includes protests over access to basic services through to the redistribution of electoral boundaries and concurrent changes in funding allocation, and mobilizations against particular economic measures (for example, attempts to clamp down on contraband or impose taxes on cooperative miners). The record number of protests would seem to go against the idea that the MAS has successfully co-opted Bolivia’s social movements. Yet, it also begs the question: if the Bolivian population is staging more protests than ever, why does Morales continue to maintain his popularity? The explanation lies in the fact that Morales’ election heralded much more than the arrival of the first indigenous person to the presidential palace. It marked the onset of a political revolution that has gradually seen Bolivia’s old political elites dislodged from power and replaced by representatives from the country’s indigenous peoples and popular classes. For this majority, the MAS government represents a safeguard against a return to the Bolivia of yesteryear, run by corrupt, white elites. More than that, for most indigenous people and social movements, the MAS government is “their” government. This does not mean that the people have handed the MAS a blank check. Already on several occasions the MAS government has been forced to back down on certain policies due to popular pressure. However, none of these protests have posed a fundamental challenge to the MAS’s overall vision for Bolivia, precisely because this vision is largely informed by the struggles and demands of the people themselves. Instead, these conflicts have primarily been disputes over how best to make this vision a reality. The MAS’s response to date has been to follow an approach of seeking dialogue and consensus, retreating where necessary but always attempting to continue to drive the process forward towards its goal. Morales constantly sums up this approach using the Zapatista slogan “to govern by obeying”. It was this approach that enabled the MAS to come into the elections with the backing of all of the country’s main indigenous, campesino, worker and urban poor organizations and to ensure its thumping victory. The failure of opposition forces and critics to recognize or accept the fact that a political revolution has taken place and important economic transformations are underway explains why they are so far out of touch with the majority of Bolivian society. Bolivia’s process of change is far from complete, and it may yet falter. It may also be dramatically impacted by events in the region, for example a change of government in neighboring Brazil. For now, however, Bolivians have once again overwhelmingly chosen to push forward with their process of change.